The Beasley is a collection of Vancouver condos bordering on Yaletown and Robson Street. This sustainable building was built as a tribute to Larry Beasley who was the Director of Planning at Vancouver’s City Hall. The single tower is located at 888 Homer and contains not only amazing homes but amenities that take Vancouver living to another level. . The developer behind the Beasley is Amacon, which in the past has brought to life many projects. Amacon’s portfolio of architecturally beautiful buildings is impressive! And here’s a Yaletown first and the best part about the Beasley! If you have a dog, you and your pup will love the building as it has Vancouver’s first dog walk and wash area! Part of the eighth floor garden terrace at the Beasley Condominiums in Yaletown will be a 60-foot dog run surrounded by park benches where home owners can hang out as their four footed companions romp and play together. You’ll find patios like this everywhere in New York and San Francisco. This feature is indicative of downtown Vancouver’s success as being one of the top most livable cities in the world! As for the rest of the amenities, the Beasley has a gym, a library, a meeting room and a party room. 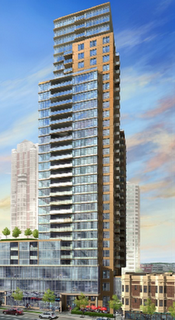 Are you ready to start living YOUR Yaletown lifestyle?? Contact your Yaletown Lifestyle Realtor for more details!